Selection of Annabel Karmels cookbooks for children, toddler and baby food. Sells children and baby furniture and bedding, including nursery items and lighting for children. New and resale baby furniture, toys, cots, buggies, 3 wheelers and children and baby clothes. Specializing in children and baby room rugs and for school and daycare settings. Specializing in personalized and embroidered gifts for infants and children. Natural bath and skin care products for infants and young children. Gentle, organic aromatherapy products for babies, children, and others with sensitive skin. Offers children and baby fashions including dresses for special occasions. Mail order tie dye clothing, accessories, baby items and t-shirts for children and adults through 7X plus size. Sells new and resale name brand childrens and baby clothing, toys, children furniture, and accessories. Room decor, furniture, accessories for children, baby through preteen. Includes store locations and online ordering. Offering brand products for newborn through preschool age children. Items include clothing, videos, baby carriers and books. Offers a variety of gifts for women, men, children, and baby such as blankets, CVD holders, frames, banks and bags. Items appropriate for children 0-8, including personalized baby blankets and clocks, educational toys, aprons and sleepover supplies. Double-sided polar-fleece baby blanket, designed to keep children warm in strollers, car seats, sleds and jogging equipment. A variety of products for children including personalized step stools, baby quilts, bulletin boards, and room decor. Offers collectible wooden miniatures, dolls, mugs, sport balls, baby and children gifts and home decorations. Custom handmade baby and children sweaters, layette sets, blankets and ponchos. An online store specializing in baby equipment including strollers, baby safety gates, baby toys, car safety seats, high chairs, baby travel systems, and nursing seats. Keepsake molding kits to create keepsake castings of baby, children and adult hands and feet. Offers organic, natural clothing, bedding, soft sole baby shoes and moses baskets. Fabrics, notions and patterns for sewing, smocking and embroidering christening gowns, dresses, baby and doll clothing. Providing baby and children clothes in French styles from sizes 0 to 14 years in addition to decoration, bathing, toys and gift items. Offering worldwide delivery. Offering baby cakes, bed warmers, bedding, handmade quilts, baby shower supplies and books. Features an array of childrens and baby clothing, jewelry, gift baskets and baby shower ideas. If the business hours of Purple Stork in may vary on holidays like Valentine’s Day, Washington’s Birthday, St. Patrick’s Day, Easter, Easter eve and Mother’s day. We display standard opening hours and price ranges in our profile site. 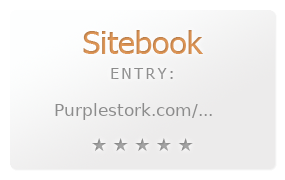 We recommend to check out purplestork.com/ for further information. You can also search for Alternatives for purplestork.com/ on our Review Site Sitebook.org All trademarks are the property of their respective owners. If we should delete this entry, please send us a short E-Mail.